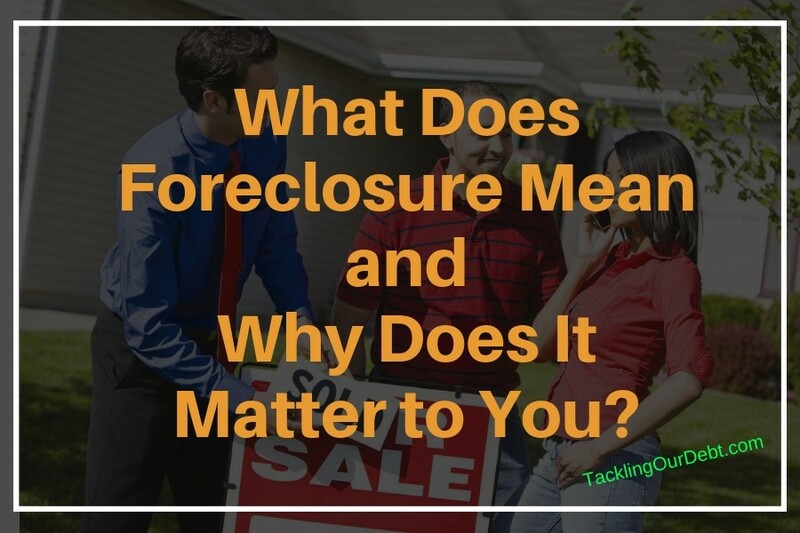 What Does Foreclosure Mean and Why Does it Matter to You? Buying a foreclosure has many perks and drawbacks, yet one thing is clear – if you’re looking for a home on a tight budget, read on. First of all, it’s important to realize that banks aren’t desperate to sell foreclosed homes. In case you don’t know, a foreclosure is a house that once belonged to a homeowner but now belongs to the bank. The homeowner either voluntarily deeded it to the bank or simply abandoned it. Sometimes it’s possible to find some pretty deals, but before you make your final choice, learn about what foreclosure means and why it matters to you. There are tons of reasons why sellers go into foreclosure. The most common reason is that they were unable to pay off a mortgage. They missed multiple payments and failed to pay back interest. After the bank proved that a homeowner was unable to pay off a mortgage, it started the process of repossessing the house. That’s how that foreclosed house that you’re considering buying appeared. Is it worth a deal? Perhaps, but it might not be as easy as you think. What Does a Short Sale Mean? If your house was foreclosed, you can negotiate with your bank about a short sale. This is the period when the mortgage company provides other people with an opportunity to pay less money for the house than you owe. This means another person could purchase your house at an extremely reduced price. This could also be a great opportunity for you, as instead of paying the full price, you might end up paying below market value. The process is slow and long, though. A prospective homeowner considering a short sale must know that they will more likely get the house “as is,” which means there might be tons of expensive home-improvement works down the road. And, in most cases, a buyer isn’t allowed to see the house before purchase. When Should You Contact a Foreclosure Attorney? Dealing with a foreclosure is a headache. With all legal proceedings, it’s usually impossible to handle the process without a foreclosure attorney. It’s best to contact a foreclosure attorney as soon as you receive an email from your lender about the beginning of the foreclosure process. Despite having limited time, the lawyer can take the actions needed to delay the process. If you wait too long to contact an attorney, the lender might complete foreclosure and even sell your house. In this case, it’ll be extremely hard to get your house back even if you hire the best attorney. Sometimes legal violation happens during the process and only a foreclosure attorney is aware of how to prevent it. If you’re going to buy a foreclosure, you’ll more likely face a lot of challenges. A foreclosure attorney might help you overcome those challenges and win a great deal. Professional foreclosure attorneys, like Ronald D. Weiss, have helped a lot of people to save their houses from foreclosure. If you’re about to give up on your home, you can give it another chance by contacting an attorney.